Horror Math Match Up Game! Here we have 24 characters from 12 horror films. Can you match the proper numbered pairs together and name their films? 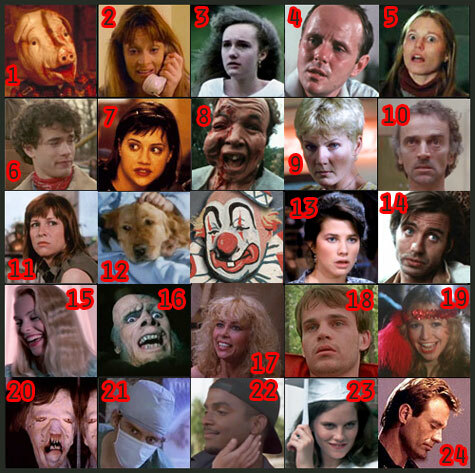 (Example: 1 + 17 = MOTEL HELL) Good Luck! Note: Extra points awarded if you can accomplish this feat while listening to EBN-OZN’s International smash hit “Bag Lady” (I wonder)! I know 13 is from The Initiation but I don’t know the second one and it’s killing me!!! I’ll go with 11. And the last one is a wild guess… 4 + 12 = Magic? Amazing job, you guys! Very impressive! Hope you liked the game. It was fun doing something different. JennyD13, great guess with THE INITIATION! That is its star Daphne Zuniga.I was trying to be tricky with the FLY 2 doggy. And have a great and safe weekend!! !